Clair UK’s first outing with the new CADAC CDC Four compact digital live console has been a major success for the sound company. The company’s deployment of the CDC Four with the new Clair iMicro small format line array, on the highly successful Footstorm tour, for production company Accept Management, achieved new standards for low profile, large scale theatre-sound reinforcement. An original dance and music extravaganza presented by the contemporary Irish dance company Prodijig, Footstorm debuted in Dublin’s Olympia, before touring mostly sold out houses across the UK throughout April and May. Playing in major regional theatres and concert venues, like Birmingham Symphony Hall, Footstorm demanded a compact console capable of the highest quality sound reproduction, to maximise the performance capability of the iMicro system; the CDC Four offered CADAC sound and performance with a highly compact form factor. 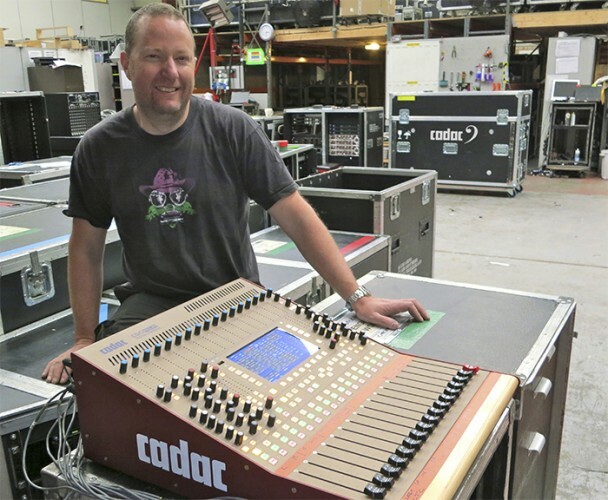 "As a theatre production, the production team was familiar with CADAC and in our previous incarnation as Concert Sound we owned a couple of CADAC analogue desks," explains Aron Ross, Clair UK’s General Manager, "So, with that experience, we had no doubts about the likely sonic performance of the CDC Four and in listening tests before the tour it impressed us effortlessly. Its small footprint for a console with this sound quality made it perfect for the FOH position, requiring far fewer seat kills than any equivalent quality desk. "People usually view Clair as a large scale rock’n’roll company but in truth we have extensive technical experience across all sectors of live production. The iMicro is a very small format line-array. An 8-inch based, 3-way system weighing just 24kg (53lbs), perfect for theatre-based productions of all types. We’ve been proving that night after night on Ian Anderson’s ongoing Thick As A Brick tour, and the success of Footstorm has underlined this even further." Commenting on the performance of the CDC Four with the iMicro system on the tour, FOH sound operator Tim Peeling says: "This was a great opportunity to put the new CADAC through its paces. Clair UK paired it with their stunning new compact line array system and a Mac based playback system running QLab theatre cueing software. I think CADAC has really got it right with this little console, its sonic quality is excellent with masses of headroom, and the EQ is also impressive; they’ve done a great job of modelling the sound of their big analogue consoles on the CDC Four. The feel of it is also really good; the build quality is solid and the faders very responsive. "The little board really shone through Clair’s new system. It was so easy to cover all seats cleanly and evenly with such a light and powerful system; small enough to get each cabinet exactly where it was needed without compromising any sight lines. And weight was never an issue, with the eight cabinet array coming in under 250kgs. The console and PA system was a great pairing and I am looking forward to using them together again very soon." After a months rest in June, The Footstorm kicked off again with the CDC Four and iMicro array, with three nights – 5, 6 and 7 July - at London’s Sadler’s Wells Peacock Theatre. In picture: FOH sound operator Tim Peeling gets the CDC Four ready in the Clair UK warehouse to go back out on Footstorm.